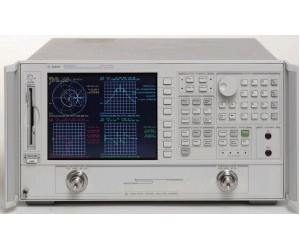 The Agilent 8719ET vector network analyzer allows characterization of RF and microwave components at an affordable price. The Agilent 8719ET includes an integrated synthesized source, test set and tuned receiver. The built-in transmission/reflection (T/R) test set provides a full range of magnitude and phase measurements in the forward direction. Built-in vector accuracy enhancement techniques include one-port, response, and enhanced response calibrations.